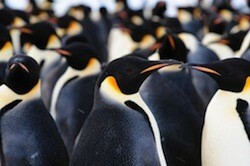 In December, a massive new colony of emperor penguins was discovered in Antarctica when humans visited a remote location on the eastern coast of the continent for the very first time. Scientists estimate that the colony is home to more than 9000 individual birds, which is forcing them to reconsider their previous estimates of overall population numbers found elsewhere in the Antarctic. According to Discovery News, evidence of the colony’s existence was first spotted via satellite back in 2009 but no one had been able to visit the location to confirm that the birds were actually there. However, in early December of last year, three staff members from Belgium‘s Princess Elisabeth Antarctica research station made the 30-mile trek out to the site to take a look for themselves. What they found was nothing short of remarkable. The trio first had to navigate through a maze of crevasses just to reach the coastline and when they did make their way down to the water, they discovered more penguins than they had ever thought possible. According to their report, there were five distinct groups of emperors with each group numbering in excess of a thousand birds. Perhaps more importantly, they estimated that about 75% of them were young chicks. Locating this large colony is seen as a good sign for the overall health of penguins in the Antarctic. Previously, scientists had believed that their numbers could be in decline due to shrinking pack ice in and around the continent. Due to global climate change, the birds still face significant challenges in the future, but for not it seems they are in better health than was first suspected.